My grandmother never went anywhere without a couple in her purse. I remember her handing them out during the most boring parts of church. (And there were a lot of boring parts in church.) Now that I’ve foresworn sugar, I was relieved to find a sugar-free recipe for caramel candy. This is the soft melt-in-your-mouth kind of caramel, not the hard kind. I’d put them on the fudgey end of the caramel candy spectrum. All you need is butter, cream and a little sweetener and you too can make this grandmotherly confection. First, you melt the butter over medium-low heat and cook it until it browns. Add your sweetener and pancake syrup and cook until it thickens and becomes gooey, about 3 minutes. Add cream and cook for a minute more. Transfer the mixture to a bowl and whisk until it cools a bit. Then pour it into candy molds and chill for a few hours until they harden. And that’s all it takes to make this classic treat, heralded by grandparents everywhere. These low carb soft caramel candies are a simple grandmotherly treat that you can make yourself at home. And each caramel has less than 1g net carbs. 1. Attach a candy thermometer to a medium sized sauce pan. Add butter and melt over low heat. Stir in syrup and sweetener. Bring to a simmer, stirring constantly. 2. Simmer mixture over low heat, stirring constantly, until mixture reaches 220 degrees F, about 3 minutes. Stir in heavy whipping cream. The mixture will be bubbly. 3. Continue heating mixture, stirring constantly, until it reaches 250 degrees F, about 1 minute.. Remove mixture from heat. 4. Mix in vanilla extract and salt until smooth and combined. 5. Transfer the mixture into a bowl and whisk for several minutes as it cools down. 6. Drop spoonfuls of the mixture into the wells of a candy mold. 7. Freeze until set, at least 2 hours. 8. Store in the refrigerator in an airtight container. This recipe was modified on 4-10-2019. If you liked this low carb candy recipe, then you might like my recipes for Cherry Covered Chocolates, Thin Dinner Mints or Chocolate Coconut Candies. 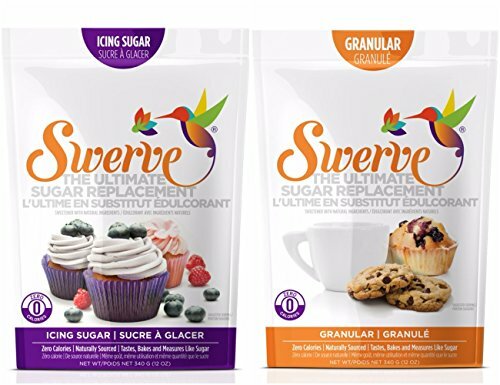 Is powdered swerve the confectioners swerve or regular swerve put into a grinder and made into powder at home? You can use either one. Confectioners Swerve is less common, so I put in the explanation of how to turn regular into powdered for the people who didn’t have it. Oh my gosh, these are sooo good!!! Mine aren’t as nice a color as yours, but they taste great! I only had unsalted butter, so I added salt a pinch at a time until I liked the taste. I made a 1/4 batch because I wanted to see if it will be suitable for what we call Millionaire’s Shortbread (it’s bars that are shortbread bottom layer, caramel layer, topped by a chocolate layer) These aren’t sticky like “real” caramel, but I love the flavor and I think it will work fine for the bars. But I think I’ll probably regularly make bite sized ones as well, I could eat these all day! Yay! I’m so glad that you liked the caramels. I’ve actually posted a version of Millionaire’s Shortbread before. But I used caramel cheesecake for the caramel layer. Curious to see how it would taste with actual caramel. Check back in and let me know how it goes. Sounds yummy! Can you use a liquid sweetener? I don’t have any powdered, but I have a BUNCH of liquid. I think so, but I’ve never tried it so I don’t know how much sweetener you’d use. Sorry! Yum!! I’ve actually never really liked Werther’s, but I love homemade caramels and need to try this sugar-free version. I love the shapes, too! Thanks! I love soft caramels too. This is soooo good! Caramel is one of my favourite foods! I have modified this recipe a bit – doubled it for one thing, only use Kerrygold grass fed butter (tried it with other butters and the Kerrygold seems to brown better and impart a deeper flavour) and at the cool down stage as I’m stirring it just before pouring in the molds, I add 1 tsp of vanilla and 1 tsp of caramel extract. Not only do they look rich, they taste just like a real full sugar caramel. Thanks so much for the inspiration! This doubled recipe makes about 64 small caramels about 1 tbsp each. Combine this with a yummy gooey Keto Fudgy Brownie recipe . . . Over the top goodness! Sweet! Those sound like great additions. I’ll give them a try next time I make this recipe. This is one of my favorite candy recipes on your site. It’s a great recipe. Do these need to be stored in the fridge after they have set or can they be left at room temp? They should be fine at room temp, but they’ll last longer if you store them in the fridge. 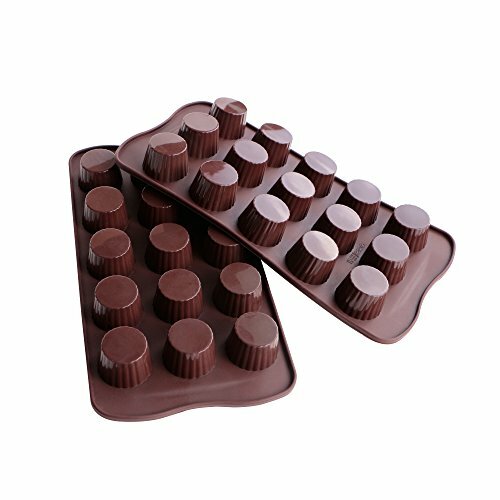 The link for the candy mold directs you to a bath bomb metals mold at amazon. You might want to change that lol. I’m gonna try these!! Whoa, weird. Thanks so much for letting me know! OMG! Love them. I made them today and I just happened to have SF caramel syrup and used a little of that with 3 of the swere and they are the best! Thank you so much, I love that it is butter based instead of coconut oil. Nice change! BYW, my son came over as I was putting them in the freezer and he added bacon bits to a few of them. YUM! Mmmmmm, bacon. That sounds delicious. Hi! I made these, tonight. They have been in th freezer for several hours. But they have not hardened. They are still kind of mushy. Any ideas/thoughts? (They taste great! ).